This Module includes a Traditional Medicine Singing Bowl Ceremony that will integrate the calming of the senses and deep relaxation for the body and mind. The ceremony will include some calming chants and a sound bath of singing bowls that will allow you to rest in your own awareness. *The Singing Bowl portion of this module will be guided by one of Peaceful World Yoga's Lead teachers, Irene Landers and will have the feeling of a mini retreat. ​​Ayurveda, or Traditional Indian Medicine, is the oldest documented health care system in the world. The science has existed for over 5,000 years. Today, the source Ayurveda texts have been translated from their original Sanskrit, giving rise to Ayurveda’s growing popularity across the globe. Ayur (life) – Veda (science) literally translates to “the science of life.” The health system offers overarching principles of matter, energy, and space as well as highly practical guidelines for preventing and managing health. 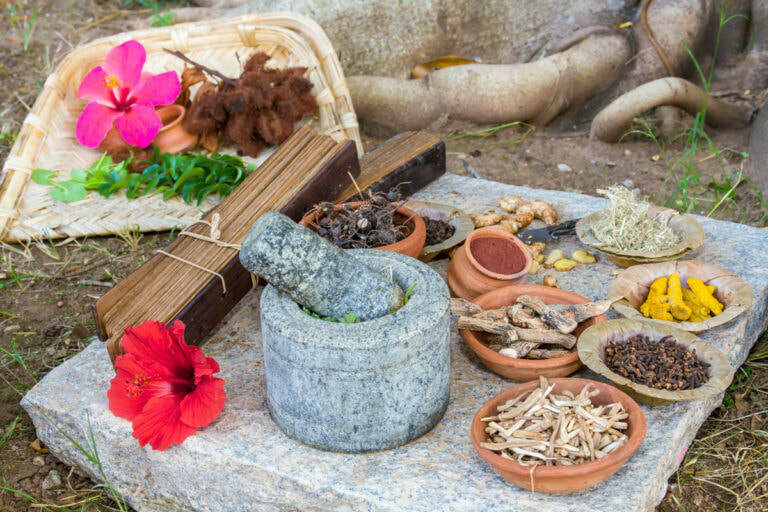 Ayurveda is a vast health system; however, its approach to wellness is simple and intuitive—so much so that we like to call it the “common sense science.” Its objective is to approach wellness through the balance of the mind and body through lifestyle practices, natural therapies, and herbal remedies. Yoga and Ayurveda are closely related spiritual and sacred sciences that are rooted in the Vedic tradition. Ayurveda is the Vedic science of Self-Realization that depends upon a well-functioning body and mind. Both disciplines practiced together can address our entire nature, our greater life as a spiritual being, and enhance our life as a householder. Come expand the broader scope of Ayurveda, which includes not only physical well-being but also mental well-being and preparations for lifestyle changes. to align the natural rhythms of the body and mind. These practices include daily nourishing and cleansing practices that help to set the course for the day and allows life patterns to fall into place. The benefits of a Dinacharya practice is to regulate the nervous system by cleansing and nourishing the body and mind daily and to work through the habitual actions that accumulate day after day, week after week, month after month, and so on. The actions we build upon daily become the product that creates our life cycle. When we learn to nourish ourselves on a regular basis, we set the course of balance and harmony. Once the nervous system becomes more regulated, sleep and digestion also come into balance and we can open ourselves up to connect with something that is greater than ourselves each and every day. “If you can take the time to do a daily nourish/cleanse routine you will quickly reap the benefits of a more balanced and regulated nervous system and life. These are practices I do daily.